In addition to her wildly successful career as a freelance writer for publications like Entrepreneur and Forbes, Carol Tice has created an enviable income for herself telling other writers exactly how to follow in her footsteps. When she asks people who don’t have enough clients what their marketing plan is, they usually don’t have one. They’re usually not marketing regularly at all. Advice can only take you so far if you’re not putting in the work. If you feel like you aren’t bringing in new clients, check and see if you are falling victim to one of these classic five excuses for not getting out there and selling your products and services. If you really, actually don’t know enough about your new field or your own business—or what you want it to be—to start putting it out there, you can hurt yourself by rushing it. That said, there are tons of ways to safely put yourself and your new business out there even when you don’t have a lot of experience. Do I actually not know enough? Or am I afraid? Feeling like you can’t start selling because your logo, your website, your email newsletter, and your invoicing software aren’t ready yet is a common way to keep your business grounded. Unlike feeling like you can’t sell because you don’t know enough, thinking you can’t sell because [insert branding area or marketing tool here] isn’t ready yet is just classic procrastination. If your website (or whatever) isn’t what you’d like because you don’t have the money to hire a designer yet, get out there and earn some money to pay for it! If you don’t have the perfect business name, just use your own name for now. Incorporating or setting up an LLC can come later. But the reality is that we are incredibly busy as moms, and launching a new business at the same time, especially in today’s world of ever-changing online marketing, takes time that shouldn’t be underestimated. It is okay to build your business slowly. But you have to take steps to make sure it grows. If your business isn’t growing at all or as you’d like, get another hour of babysitting, hire a cleaner, or, if you don’t have any non-work work left to optimize, change some of your working hours over to (better) marketing. Notice that though the title of this post is “Are You Selling?,” I’ve spent a lot of time talking about marketing. That’s because they should be linked. 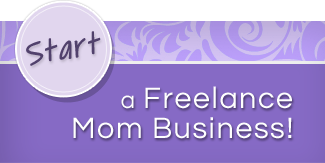 However, the problem for a lot of struggling FreelanceMoms is that they aren’t. People feel like they are marketing, but they aren’t getting business. But we haven’t talked about how continuing to do the same types of marketing that don’t actually bring in any sales is also not marketing. Do you spend a lot of time applying to job ads on Craig’s List, for example? Use BloggingPro, Problogger, or Journalism Job instead. 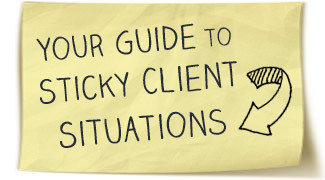 Or, better yet, find your own clients from scratch. Have you exhausted your network asking them to tell people about your new graphic design business? Check out the websites of local businesses, see who could use an overhaul, and give them a call. Has the well of coaching clients from your webinar series with some big name coach dried up? Start guest blogging on PsychologyToday.com or a large site that’s related to your type of coaching but not about coaching—so you don’t have competition. Are you making as much money as you want to make? Because if you are working a lot and not hitting your income goals, something is wrong. Maybe it is time to look at your business model. We talked recently how charging low prices when you first start your business has a host of downsides, but the worst is getting stuck working too many hours for too little money. You should always be doing some marketing for your business to make sure you have options in case you lose a client or all your projects wrap up at once—but also because you should always be raising your prices. You current clients are used to paying a certain price and it can be hard to get huge raises from them, so the best way to charge more is by bringing in new business. Don’t you want to earn more for the work you already do? Then get out there! What holds you back from marketing and selling?